I have made Kerala Style Fish Cutlets for many occasions but somehow never got to post the recipe. 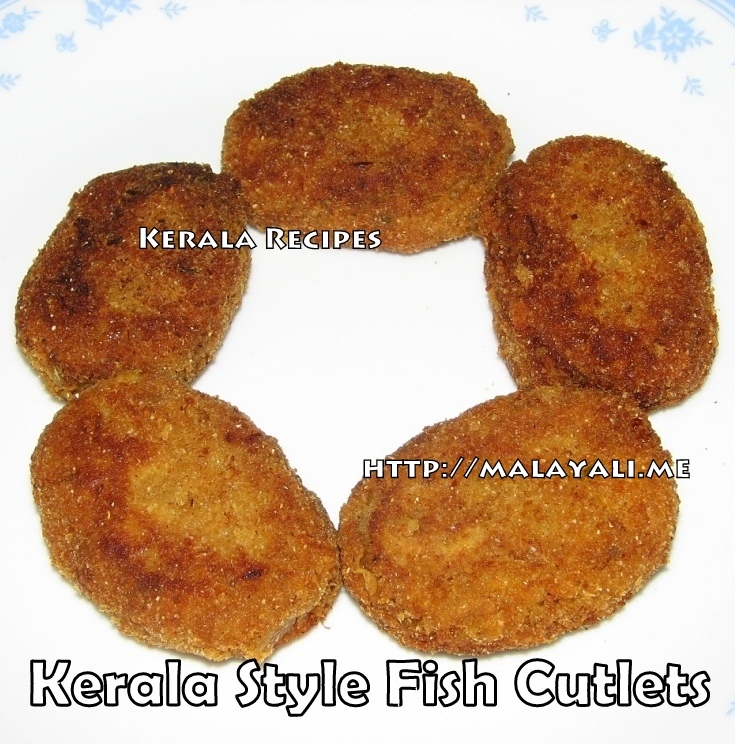 These fish cutlets make an excellent appetizer along with Kerala Onion Salad (Sarlas). I have tried both Canned Fish as well as Fresh Fish Fillets for making these cutlets. Here is the recipe for yummy fried fish cutlets. Boil the potato along with salt until well cooked. Allow it to cool and then remove the skin. Mash it thoroughly until there are no chunks (Alternatively, you can pressure cook the potato until cooked). Add red chilly powder, turmeric powder, coriander powder, fish masala powder (optional), pepper powder, fennel seeds powder (optional) and garam masala powder. Saute for 2 minutes. Drain the water or oil from the tuna and add it to the pan along with salt to taste. If using fish fillets instead of canned fish, see the note section. Mix everything well and saute the tuna for around 10 minutes. Allow it to cool. In a large bowl, combine the cooked fish and mashed potatoes using your hands. Do a taste test and add more salt if needed. Make lemon sized balls using your palm and flatten the balls to form cutlets of any desired shape. Place it on a plate or tray. Place the cutlets slowly in the pan and fry each side on medium heat for 2-3 minutes until golden brown. Drain onto paper towels. Serve these tasty fish cutlets with ketchup, onion salad, mint chutney or any dip. You can use Fish Fillets instead of Canned Fish. I have made these fish cutlets with Tilapia Fillets and it tasted good. If using skinless & boneless fillets, wash it thoroughly and cut it into medium sized pieces. Follow the same procedure. While cooking the fish, stir frequently with a spatula so that the fish breaks down into small pieces. You need to saute the fillets for around 15 minutes. Alternatively, you can microwave the fillets for 4-5 minutes until tender. Shred the fillets using a fork and then saute it with the other ingredients in the same manner. This will reduce the cooking time. If using Fish with bones like King Fish, boil the fish with salt and turmeric until done. Remove the bones and shred the fish. Saute it with the remaining ingredients. You can easily make 20 cutlets with 2 Cans of Tuna. thank you jisha for this wonderful recipe. it is excellent as an appetizer. I have never made fish cutlet before, for the reason that it will smell of fish. But I gave a try and it came out amazing. Thanks a lot for changing my mindset.